Wildwood Spirits Co. is having an excellent year. The company in Washington state took home gold for its “The Dark Door” bourbon in March at the Berlin International Spirits Competition. April brought two more wins at the San Francisco World Spirits Competition: gold for “The Dark Door” and double gold for its “Kur Gin” (pronounced “cure”). “Michigan-born, Washington-made,” said Erik Liedholm (BA Hospitality Business ’92), distiller/partner at Wildwood Spirits. Although the company operates out of the Pacific Northwest, its connections to East Lansing are carefully curated by Liedholm, born here and raised on Wildwood Drive, near Michigan State’s campus. “My dad [retired economics professor Carl Liedholm] was a professor at Michigan State for [nearly] 54 years. Michigan State and East Lansing [were] always just a part of growing up,” Liedholm said. References to his old neighborhood can be seen throughout the company’s products, from “The Dark Door,” named after his childhood home’s iconic black front door, to a newly developed Irish-style whiskey. “We’re producing a whiskey that we’re just putting into barrel … It’s going to be called ‘Old 830,’ and my parents’ address is 830 Wildwood,” Liedholm said. 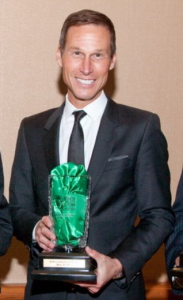 Liedholm has stayed active in the MSU community as well, serving on the Eli Broad College of Business Alumni Advisory Board and frequently offering his time as a guest speaker for the university. He is also an honorary faculty member of the School of Hospitality Business. Liedholm was a student of Borchgrevink’s in the early years of the latter’s teaching career at MSU, which began in 1989. “He was always very tenacious and diligent, interested … always focused on maximizing his time in the classroom,” said Borchgrevink. Both Borchgrevink and Liedholm believe alum involvement in the college after graduation is vital to the success of both alumni and current students. “[Wildwood Spirits Co.] developed everything at Michigan State,” said Liedholm. 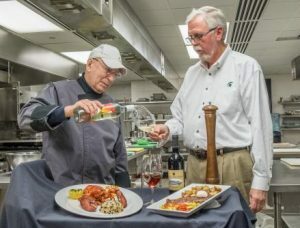 “We did all of the beta tests [of] our spirits with Kris Berglund,” a chemical engineering professor at Michigan State.” Liedholm has also used the psychoacoustical expertise of MSU professor William Hartmann to fix an echo in one of his restaurants. “[Alumni involvement] is great for potential students who are thinking of coming to MSU. It’s also great for us internally … to see the fruits of our labor,” said Borchgrevink. There are many [speaker] series and organizations at MSU that exist to connect students and alumni. “Some of the most impactful moments in going to Michigan State were the guest speakers we had – it was … like the real world” said Liedholm. He attended a seminar during his undergraduate career held by Josh Green, publisher of then-fledgling wine publication Wine and Spirits Magazine. “[It’s] ironic that two years ago, our gin was named as [one of the] Top 10 Spirits of the Year [in Wine and Spirits] … it’s like a full circle,” Liedholm said.